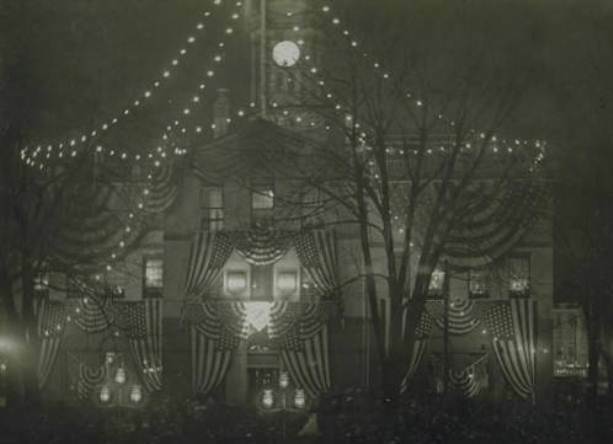 Above City Hall’s Main Street entrance, white lights traced out the year 1900, which upon the stroke of midnight changed to 1901. “It was the first time the building was ever illuminated in this way and everybody was pleased with what had been done,” crowed one observer. A 21-gun and cannon salute, a midnight parade, band music, and choral performances by a number of German singing societies, including the Sängerbund, rounded out the formal program. In Hartford, as elsewhere around the state, religious observances also marked the year’s end. Write-ups before and after the holiday recounted in some detail the variety of Christian services held (but made no note of other religions’ gatherings). Catholics attended midnight Mass. Methodists, Swedish Lutherans, Baptists, and other Protestant denominations held watch night services. Some of these began at 8:00 pm and lasted past midnight, as those assembled listened to addresses and sermons, remembered the deceased, worshipped, and, sometimes, partook of light refreshments during an intermission in the proceedings. Why Was New Haven Divided into Nine Squares?